Wyoming (2-2) is coming off their first bye of the season following their narrow victory over Wofford. They will be at home this week as they open Mountain West play against #25 Boise State (2-1). Boise is also coming off a bye of their own and before that lost at Oklahoma State. I would take a second and thank Brandon Foster from the CST for helping us out and being apart of this weekly feature. Brandon has accepted a different position with the CST and after this week Davis Potter, the new Pokes beat writer for the CST will take Brandon’s spot on 5 on 5. So, from all of us at WyoNation, thank you for giving us your time and thoughts, Brandon, and we wish you nothing but the best in your future endeavors. What are your thoughts on Wyoming through their first 4 games? I don’t think the 2-2 record is a huge surprise, but how it came about is. I think most people thought — myself included — that the offense would have been more consistent, as well as the defense in terms of getting pressure on the quarterback and getting a push up front. Injuries to certain positions (TE, DE and RB) haven’t helped. But when healthy, this team still has a chance to be pretty good. How do you see the rest of the season playing out? Biggest concern and/or surprise? 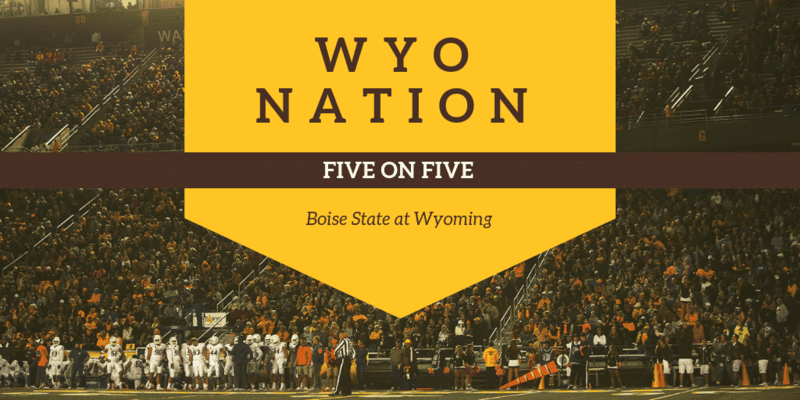 Each week will be a dog fight in conference play, but if the Cowboys can continue to progress on offense and find some more balance and consistency and the defense does what it is capable of, Wyoming has a chance to maybe contend for the division title and get back to a bowl game for the third straight season. It must play its best game since the opener at New Mexico State. It can’t let Boise State run the ball well, and also must make Broncos senior quarterback Brett Rypien uncomfortable in the pocket. What I said above about the defensive line, the offense is balanced, converts third downs and finishes more drives with points. And, the team that wins on special teams likely wins this game. On the one hand, I feel like Wyoming is in a pretty shaky place after four games. UW barely kept afloat against Wofford, the defense hasn’t kept up its dominant pace from last year/the season opener, and the offensive struggles have manifested in ways that many fans feared they would. On the other hand, the Cowboys are 2-2, a fairly reasonable place to be given their schedule, and things could be waaaaay worse right now if not for that game-winning drive against the Terriers. If the Pokes can heal up, and if the defense’s struggles are simply a product of the tough offenses it has faced, then they should be capable of getting right back on track. I have enough concerns about this team, and its schedule, that I think we might be in for another year in which the Cowboys are in for a bowl berth but not the conference title game. That schedule is perhaps the biggest concern. This team needs to regain its footing, and having to open with Boise State (which also just had a bye) doesn’t make that any easier. Neither does going to Hawaii and Fresno State after that in consecutive weeks. The biggest surprise for me so far has been how well Nico Evans has played. If he returns to form, this team is much more dangerous. He has the potential to be perhaps the most dangerous threat in the passing game for this team. If he can get back to that, Tyler Vander Waal and his rejuvenated confidence might be able to take another step forward. Evans and the defense play like they did in Las Cruces. That’s asking a lot, but so is beating Boise State, and I believe that’s probably going to be the winning formula for the Pokes this year. Realistically the Cowboys are where we should have thought they should be. The only exception here is that Wazzu could and should have been a winnable game. However, the Cougars have excelled greatly under Leach during his time there. They were just simply a much deeper team than Wyoming. Reality of a power five team vs a group of five team. Pokes fans should be happy with 2-2, could have been worse for not a last minute touchdown to beat Wofford. Wofford aren’t slouches by any means, but you never want to see an FCS team get that close. Tyler Vander Waal looks like he’s shaping up into a good young quarterback, seems to be growing every week. Would be nice to see this team fully healthy for a while. Defense is keeping it close for the time being. Going to be a tough haul for the rest of the season now that we’re into conference play. Boise State will obviously be a very tough game. The game against Utah State is looking very tough now. Air Force is always a struggle, but the Falcons have also struggled this season. Colorado State usually brings it for the Border War no matter how terrible they look. Fresno State looks like they could put a hurtin’ on the Cowboys if they aren’t on their game. San Jose State is probably considering dropping football at this point. Cowboys need to go 4-4 the rest of the way to get into a bowl game. New Mexico doesn’t appear to be a contender. Hawaii is an interesting team, be curious to see what they do the next few weeks. I can see wins against the Sheep, San Jose State, New Mexico and Air Force. Boise State quarterback Brett Rypien has been one of the best quarterbacks in the country this season, and definitely one of the best in the Mountain West. The Broncos are rolling at this point, despite a loss to Oklahoma State. Slowing Rypien down is going to be a big factor for the Cowboys this week. To do that they will need to get some pressure on him and get him out of the pocket. The defensive line will need to collapse that pocket and get to Rypien for any kind of sustained success this weekend. Kind of the same story as every week. Don’t turn the ball over. Establish the running game early, keep Vander Waal upright. Defense needs to limit or eliminate big plays. Getting to Rypien and force him into some mistakes. Simple game plan, really. The record is what most people expected at 2-2. The offense has been disappointing outside of the first game against New Mexico State. The defense has done well but I think most people thought we would see better performances against Washington State and Missouri. Now we are on to the conference season with a division title and bowl eligibility on the line. The offense is the number one concern for me. A healthy Nico Evans and Austin Fort should help at RB and TE to boost the offense but we really don’t know how healthy they are. Wyoming can win or lose any of their remaining games so it will be up to the offense to help the defense out. If the offense can improve as the season goes along Wyoming should be going bowling for a third consecutive season. Wyoming’s offensive production has taken a nose dive since he was injured early in the second half at Washington State. If he’s healthy he is certain to receive the bulk of the carries versus the Broncos. They have their best all-around offensive performance in some time. The Wyoming defense can keep Boise Sate in the mid to low 20’s but I’m not sure the Wyoming offense can match that. I am not surprised the Pokes are 2-2 but I am a bit surprised how everything has transpired. I thought the Pokes let one get away from them against Wazzu and that Wofford game was much closer than anyone anticipated. The Cowboys have a been a bit banged up and they need to get healthy in order to compete going forward. I definitely see the Pokes winning 4 of their remaining 8 games, if they get hot and find some offensive rhythm they could win 6 of their final 8. I still think they are going to go bowling for a third straight year. My biggest concern outside of the lack of offensive production is the lack of pass rush. The defensive line was supposed to lead the defense and be among the nation’s best and in my opinion they haven’t lived up to expectations. TVW is going to have to make some plays early in the football game. He has shown he has the ability to be a solid quarterback and now that we are 1/3 into the season, now is the time to turn the corner. They win the turnover battle by at least two and win third down on both sides of the ball. Boise doesn’t turn the ball over much, so winning that battle by a couple is not going to be easy. The defensive line getting pressure will go a long ways.